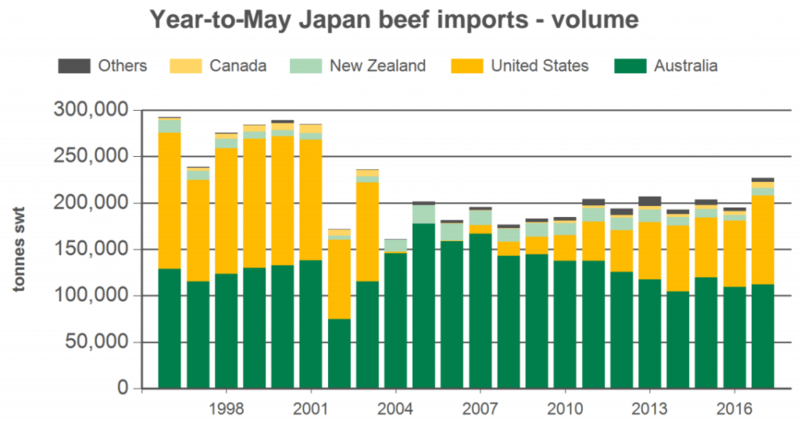 Japan beef imports approaching pre-BSE levels – but what does it mean for tariffs? IT’S taken 14 years to do it, but Japan this year is on track to import close to 550,000 tonnes of beef from all offshore suppliers – the largest volume since 2003, when the country’s appetite for beef collapsed due to concerns over BSE. Beef consumption in Japan fell in a huge hole after the December 2003 discovery of BSE in the US, and imports have only recovered at snail’s pace since then. In 2003, Japan’s total pre-BSE beef imports were a massive 576,000 tonnes. Volume dropped by about one-third the following year, due to BSE concerns, and 13 years later, in 2016, had still only recovered to 503,000t. But for the five months to the end of May this year (see graph above), beef imports from all destinations are up an eye-catching 16 percent year-on-year, and at the current rate of trade, will go close to the pre-BSE era volumes for the first time, estimated by MLA at close to 550,000t. Somewhat unusually, both the major suppliers of imported beef to Japan – the US and Australia – are recording rapid growth in volume at the same time. More traditionally, growth for one has been at the expense of the other. Australia’s exports to Japan for the year-to-date to June are up 12pc. At 279,000t, Japan was the only major export destination of Australian beef to record an increase in the financial year to June 30. But the significant part of that is that virtually all of Australia’s growth is in frozen beef, mostly manufacturing. Meat & Livestock Australia’s Japan region manager Andrew Cox told Beef Central yesterday that that was mainly due to strength in the food service area, particularly the Quick Service Restaurant businesses like McDonald’s. “The quick service restaurant sector has bounced back strongly in Japan this year, and it partly explains why those frozen Australian shipments have risen sharply,” Mr Cox said. Relatively lower demand for Australian manufacturing beef from the US due to higher US domestic beef production had also had an impact. 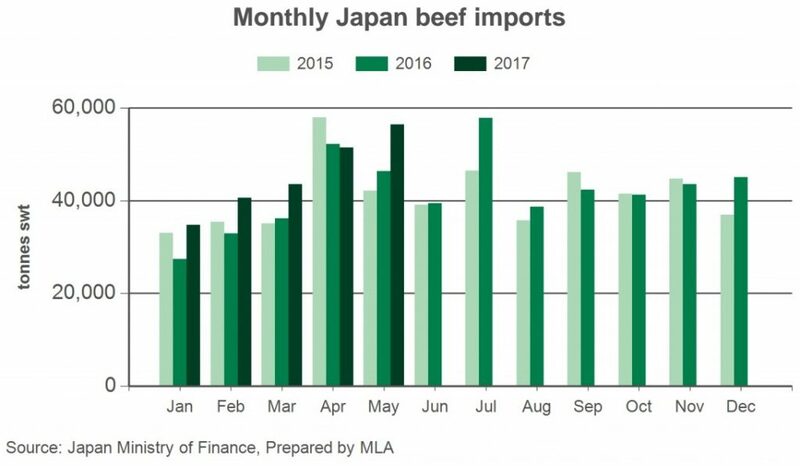 Japan had effectively been ‘bidding away’ both lean and fattier Australian frozen trimmings from other customers including the US, Korea and China this year, an Australian beef trade analyst said this week (see graph below). In contrast, the huge growth for US beef exports to Japan this year (volume plus 34pc for the calendar year to the end of May) is primarily in higher value chilled cuts – mainly because of supply and price (relatively more abundant and cheaper than Australia). The US’s ability to produce large volumes of single-cuts that are highly desirable in Japan, like shortrib, shortplate and chuck has also favoured US chilled supply. Interestingly, Japan is buying less of these items from Australia and focusing their attention on US beef. From Australia, Japan has focused its buying habits and is buying more round cuts and thin flank meat, trade sources said. As a result of its current very strong price advantage over Australia, the US has enjoyed strong penetration in Japan’s retail segment in 2017, MLA’s Andrew Cox said. All of Japan’s major retail supermarket groups typically carry both Australian and US product, so when there is a large price swing in favour of one over the other – as there has been in the past 12 months towards the US – they are able to very rapidly shift their offer in that direction. “Imported beef, as an overall category in Japan, is currently performing really well,” Mr Cox said. “Against that, domestic Japanese beef production is flat, at best, and tending towards continued decline. Usually Japanese Wagyu and F1 Holstein accounts for 40pc of all beef consumed in the market, but I don’t expect it to be anywhere near that high this year, and could be as low as 35pc,” Mr Cox said. Another factor was that Japanese consumer demand at the moment was leaning towards leaner beef, which favoured imports over domestic. “There’s not a whole lot of money in domestic beef production in Japan at present. Purchasing a Wagyu calf to feed now cost around US$10,000,” he said. Additionally, during 2016, Japan ran-down its beef stocks held in cold storage, and there was a surge in trade to optimise the impact of another tariff drop on Australian beef after April 1, under the gradually declining JAFTA trade agreement. Each year that ticks over under the FTA, Australian beef gets relatively cheaper than the US and NZ suppliers in tariffs on beef. 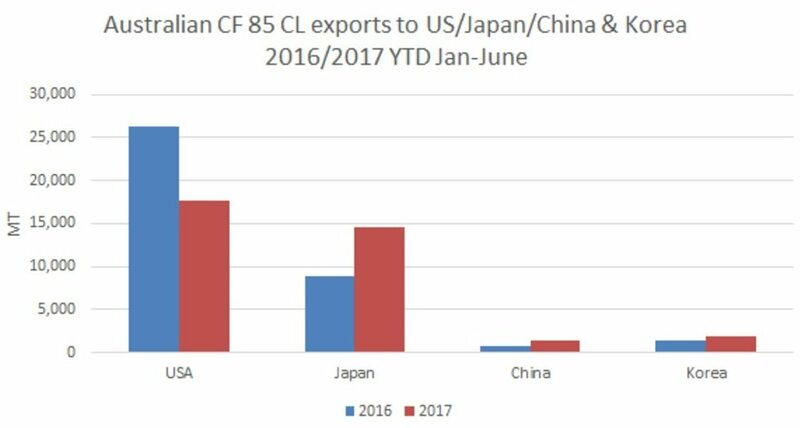 This year, while the US remains at 38.5pc tariff on beef to Japan (in the absence of any progress towards its own FTA with Japan), Australian chilled exports attract a 29.9pc tariff, and frozen 27.2pc. Each year that gets less. That represents a massive 11pc tariff difference on the same frozen product, between Australian and US beef at present – a real margin difference of around 7pc in product value, given that all trades into Japan are in US$. With the rapid rises in beef exports to Japan being seen this year from both Australia and the US (see graph below), attention is again focussing on the risk of triggering Japan’s ‘Safeguard’ protection mechanism, where tariffs applied can jump dramatically. The ‘Safeguard’ provision is a measure to ensure that large, sudden rises in beef imports do not destabilise the domestic Japanese beef industry. A recent report from US Meat Export Federation indicated that there is a risk the beef ‘Safeguard’ for imported US frozen beef in Japan may be triggered at the end of July. Australian frozen beef exports to Japan in May were 18.8pc higher than the same month last year, and June exports to Japan were 23.5pc higher than a year ago. Similarly US beef exports to Japan have been increasing in double digits as well, with calendar year to May up 34pc. If the safeguard is triggered, USMEF warns that the tariff will rise from its current level of 38.5pc to 50pc duty on US frozen beef, effective for the remainder of the Japanese financial year ending March 31 next year. US exporters and their Japanese customers are watching the numbers closely, and working hard, through managing customs clearance rates, to avoid hitting the trigger level. To hit the trigger would be an “absolute disaster,” a US trade source said. Australia is on much safer ground, however. Under the terms of the Japan-Australia Economic Partnership Agreement (JAEPA), the duty on Australian frozen beef will remain at 27.2pc, as Australian beef is subject only to a ‘Safeguard’ based on an annual assessment, rather than a three-month figure like that applied to the US. This makes it much less likely that the trigger level will be reached, analysts say. Based on figures produced by Japan’s Agriculture & Livestock Industries Corporation, meat consumption in the 2016-17 fiscal year (April-March) broke new records with 4.75 million tonnes of chicken, pork and beef consumed. Projected year-on-year growth was the fastest in five years, rising 3.4pc on the previous year – which was the tenth consecutive year of gain. In the report ALIC stated it believes the recent growth in beef consumption in Japan is due to the availability of cheap US beef. “In other words meat demand in Japan is outstanding,” an Australian analyst said. “ALIC has identified that 70pc of beef consumption is being eaten in Japanese restaurants, in particular at Yakiniku barbeque restaurants. It is these BBQ items that I believe Japan is buying in 1-3 single cut container shipments from the US; the loins are being bought out of the US; and Australia is supplying the round cuts,” the analyst said. Beef Central will file a series of reports from the Japan market from early September, as a participant in the Australian Wagyu Association’s Japan market tour, featuring the five yearly All Japan National Wagyu Show. Having lived through the BSE and associated crises in the Japanese beef industry of the late 90’s and early 2000’s and seeing the disasterous ramifications to the Australian Cattle Industry, I would like to remind your readers that Japan too had BSE. Japans first case of BSE was diagnosed in September 2001 (before North Americas first case was diagnosed) and its last reported case was in 2009. During the interim, a total of 36 cases of BSE were recorded in Japan, a country with a herd size of less than 4 million cattle. North Americas incidence of BSE is in single digits in a cattle herd some 25 times that of Japans herd. Good point, Andrew. In the interests of brevity, I chose not to reference the earlier Japan BSE episode, but it’s effect is clearly evident in the graph published at the top of the page. The graph, of course, logs imported beef only, which at that stage was not implicated in BSE – but it shows that the Japanese consumer at the time chose to avoid buying ALL beef, regardless of origin.